Native Americans figure prominently in both of the historical series I’m writing, and I’ve done quite a bit of research into the tribes who appear in the stories. It’s been, to say the least, fascinating. In the Northkill Amish Series, the father and 2 sons are carried off into captivity by a band of Indians who attack their farm during the French and Indian War. The father ends up with the Seneca and the sons with the Delaware, or Leni Lenape, so these tribes became the focus of my research. The Seneca belong to the Six Nations, or Iroquois Confederacy. Historically the Iroquois called themselves People of the Longhouse, which naturally sparked my curiosity about longhouses. I’d heard of them, of course, but when you’re writing about people who live in them, it’s necessary to describe these structures in some detail. In my next few posts, I’m going to delve into the lives of the Seneca in the 18th century, beginning with the homes they lived in: the longhouse. I hope you find it as interesting as I do! Eighteenth-century longhouses were large wooden buildings ranging in length from 30 to several hundred feet that housed the members of a single clan. Its length was determined by the size of the extended family that would live in it; the larger the family, the longer the longhouse. As the size of the extended family grew, the building was enlarged to make room for its expanding population. 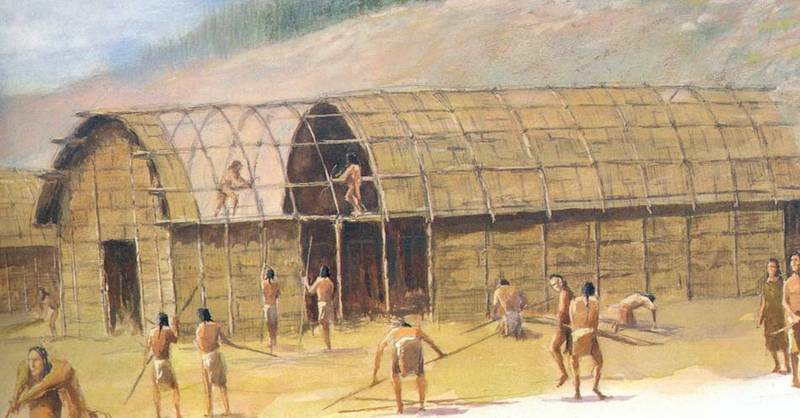 Archeologists have discovered the post-hole patterns of two enormous longhouses that were 364 feet and 400 feet long—longer than a football field and even a block; however, the typical Iroquois longhouse was between 180 to 220 feet long, which is still pretty impressive. Longhouses were generally about 20 feet wide and 20 feet high and symmetrical, with a rounded rather than peaked roofline. There was a single door at each end, covered with a fur pelt or piece of rawhide to keep out the weather. This seemed to be the general rule; only one longhouse has ever been discovered that had an extra door, located in the middle of one side. 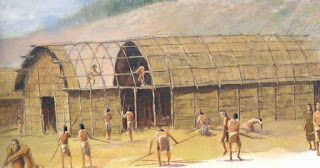 The ends of the structure were usually rounded, but some longhouses had squared ends with a flat roof overhanging the doorway or a shed-like structure that provided storage space extending from it. The forest provided the posts, poles, and bark the Iroquois used as building materials. Saplings with tall, straight trunks were cut into lengths to form the framework. To reduce insect damage and decay the bark was peeled off in narrow strips and saved for other uses. The builders set two parallel rows of strong upright posts into holes dug in the ground, spaced from 10 to 12 feet apart along each side of the longhouse. They added thinner interior posts between the outer rows to outline the walls of compartments and a central aisle, then lashed strong, flexible rafter poles to the tops of the posts horizontally from side to side across the building and bent them to form an arch. They laid more poles down the longhouse’s length to stabilize the roof, then placed additional poles along the sides to form a grid pattern to which large sheets of bark were attached to cover the walls. 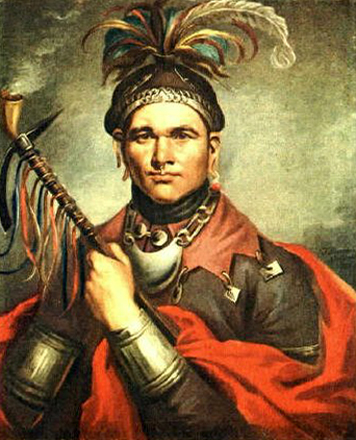 Since the Iroquois had no nails, they tied or lashed their buildings together by winding long, flexible strips or ropes of bark around the poles and posts. When these dried, they shrank and stiffened, tightening the joint. The bark of basswood and hickory trees works well for this purpose. The Iroquois used elm bark whenever available for the large sheets that covered the exterior of the longhouse. After the bark was hung on the frame, it had to be held down to keep it flat and to prevent the wind from lifting it. Another framework of smaller poles laid across the outside of the bark served this purpose. Bark can be peeled off certain types of trees during the spring while the sap flows freely and the leaves are still small. Large sheets must be flattened out with weights while they dry to keep them from curling. The Iroquois may have stored extra bark they harvested under water to keep it supple until it was needed. A sheet of elm bark that has been flattened and dried is as strong as a piece of plywood. Although it has deep furrows in it that run vertically along the trunk, the Iroquois usually applied it with the groves running horizontally. This probably was done because it was easier to keep the bark flat by securing it horizontally against the vertical posts. One account describes some Iroquois smoothing out these furrows with an adz to prevent them from catching rainwater running down the roof and sides of the longhouse. 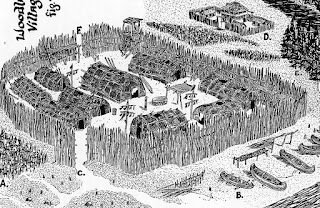 The tribes of the Iroquois Confederacy built their longhouses in villages and towns near waterways such as rivers and creeks. They were often surrounded by a palisade wall to keep out enemies. The land surrounding the village was cleared into fields belonging to the women, where they grew the crops used for food. Next month I’ll describe how the longhouse was divided up among families and how they furnished and used this communal interior space. I know, Vickie! It sure doesn't sound like there was any privacy for any activity, much less sleeping, does it? lol! It does give new meaning to the maxim that it takes a village to raise a child, however. I'd think it would be very hard for kids to get away with bad behavior! This was so informative! Thank you, and I'm looking forward for your next article. I'm glad you enjoyed it, Pamela! It really gets interesting when you learn how the interior space was divided up and lived in--and certainly inspires reflections like Vickie's comment about all those men snoring at night. lol! Go to the Ganandagan web site and you can see the doghouse they built on site. I've been inside it on living history weekends and it is amazing. Like many new Yorkers my age, our fourth grade social studies all new York history ( which i love more than ever now!) The Haudenosaunee history is fascinating but difficult. I live on what was once village along the lake. I don't take that fact lightly. That looks like a cool, cool place, Debra! Wish we lived nearer so we could visit it. The history of the Haudenosaunee is fascinating for sure. I've mainly researched the Shawnee (and briefly the Seneca) for my American Patriot Series, but now I'm really delving into the Seneca and Delaware for the Northkill Amish Series I'm working on right now. My ancestor was held as a captive at Buckaloons, which is actually in northern PA just below the NY border. Studying their way of life, history, festivals, and religious beliefs has been quite fascinating. Did you write the next blog on the long houses? I can't find it. :-( I am trying to write a cartoon story (graphic novel/story, comicbook) about how the Iroquois lived in their social structure. (Interesting observation from Vickie, about the snoring guys). I'd like to read whatever you've found about them.